In the period from 2002 to 2016 Friends of Teso dispatched thirteen containers of donated goods to Teso in Central Uganda. All arrived safely. This amazing effort by all concerned made an invaluable contribution to sustaining the most disadvantaged in Teso during a very troubled period. Early shipments were focussed on supporting the population of nearly two million internally displaced persons that had resulted from internal conflicts and natural disasters. These numbers decreased over time, however, as people returned to rebuild their communities. Latterly, the focus was very much more on assisting with the rebuilding the regions infrastructure and aiding in the development of self-supporting communities. When two representatives of Friends of Teso (Uganda) visited Soroti and Kumi in November 2015, they reassessed with our partners in Uganda the best way to offer future support. As a result, Friends of Teso (Uganda) will no longer send shipments of donated goods, but, instead, raise funds to directly support local development projects in the Teso region. We will be closely monitoring the success of these enterprises and look forward to providing regular bulletins on their progress. The original pages on this site will remain as a record of what has been achieved. Please click HERE, however, to learn more about the projects we are now supporting. Friends of Teso (Uganda) collects clothes for children and adults, books, bedding, educational materials and practical equipment such as sewing machines, bicycles, wheelchairs and other mobility aids. We then send these to Teso using money collected from our fundraising activities. Friends of Teso is a registered charity - No 1111413. Friends of Teso (Uganda) started as a result of the visit to Soroti in Northern Uganda in May 2002 by a working party from Bournemouth Deanery. The team was guest of Charles, Bishop of Soroti, and the people of his Diocese. The original purpose was to build a hostel for girls to enable them to study in safety and to protect them from molestation and the risk of AIDS. During this visit, the team was greatly saddened by the plight of the thousands of people who were living in camps for displaced people because of attacks upon them and their villages by The Lord's Resistance Army (LRA), a group who murdered many people and stole children to turn them into child soldiers and slaves. See Human Rights Watch report on conflict in Northern Uganda - July 2003. The security situation is now improving but still very fragile, and several hundreds of thousands of people are still living in the Internally Displaced Persons Camps. The LRA continue their murderous behaviour over the border in the east of the Democratic Republic of Congo. The people of Northern Uganda are rebuilding their society, but there is much to do. Vital infrastructure, such as schools and hospitals, must be rebuilt and re-equipped, and support will be needed more than ever in the coming years to help the people of Northern Uganda re-establish self-sufficient communities. December 2002 - Seven boxes of children's clothes and three boxes of books were sent to Soroti. October 2003 - 7.5 tons of goods were sent by container via the Christian African Relief Trust (CART), an organisation based in Huddersfield. October 2004 - A 20 foot container of goods was sent to Soroti, which was received with great joy and appreciation in February 2005. November 2005 - A 40 foot container of goods was despatched to Soroti on 26th November 2005 and arrived in Soroti on 22nd February 2006. CLICK HERE to view the journey of this shipment. CLICK HERE to read the response from Charles, Bishop of Soroti. August 2006 - A 40 foot container of goods was despatched to Soroti on 19th August 2006. It arrived in Soroti in October 2006. CLICK HERE to read the article from the Southampton Echo about its despatch. CLICK HERE to see photographs of the container being opened in Soroti. June 2007 - A 40 foot container of goods was despatched to Soroti on 16th June 2007. It arrived in Soroti in late September 2007. CLICK HERE to see photographs of the container being loaded. October 2007 - A 40 foot container of goods was despatched to Soroti on 13th October 2007. 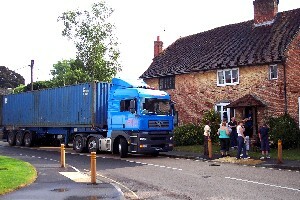 CLICK HERE to see photographs of the container being loaded. August 2008 - A 40 foot container of goods was despatched to Soroti on 23th August 2008 and arrived in Soroti on 4th April 2009. CLICK HERE to see photographs of the container being loaded. July 2009 - A 40 foot container of goods was despatched to Soroti on 18th July 2009 and arrived in Soroti in late October 2009. CLICK HERE to see a slideshow of the container being loaded. CLICK HERE to see a slideshow of the container being unloaded in Soroti in late October 2009. July 2010 - A 40 foot container of goods was despatched to Soroti on 3rd July 2010 and arrived in Soroti in mid June 2011. CLICK HERE to see a slideshow of the container being loaded. January 2012 - A 40 foot container of goods was despatched to Soroti on 7th January 2012. CLICK HERE to see a slideshow of the container being loaded. December 2012 - A 40 foot container of goods was despatched to Soroti on 1st December 2012. CLICK HERE to see a slideshow of the container being loaded. CLICK HERE to see some photographs of the unloading of this container in Soroti on Good Friday 2013. September 2013 - A 40 foot container of goods was despatched to Soroti on 8th October 2013 from the base of UKShred in Nottingham, containing goods that were loaded at Bishop's Waltham on 13th September 2013. CLICK HERE to see photographs of the loadings and further explanation. It arrived in Soroti just before Christmas 2013. November 2014 - A 40 foot container of goods was despatched to Soroti on 22nd November 2014. CLICK HERE to see a slideshow of the container being loaded. CLICK HERE to see a video of the unloaded goods in Kumi on 9th April 2015. CLICK HERE to see the story of one small part of that shipment. October 2015 - A 40 foot container of goods was despatched to Soroti on 24th October 2015. CLICK HERE to see a slideshow of the container being loaded. It arrived in Soroti in March 2016. --The original group from Bournemouth Deanery. --St James' Church, Pokesdown, Bournemouth. --Swanmore Methodist Church, Swanmore, Hampshire. --St Peter's Church, Bishop's Waltham, Hampshire. --The residents of the village of Swanmore, Hampshire. --The residents of the village of Bishop's Waltham, Hampshire. Many thanks to all who have contributed. Can you help?